I’d originally planned to release a new book in May. After delaying it a month, I was still struggling to write it. There was something about the story that didn’t quite feel right. The last – and thankfully only other – time that happened, I ended up having to take what I’ve written and throw it into a folder in the back of my computer closet. I’m fear I’m going to have to start over this time, too, which is never a fun realization. Instead of diving right back into that book, I’ve decided to switch gears. Ever since I wrote Marrying Raven, scenes for the next book in that Brides of Clearwater series have been forming in my mind. I did some plotting on Saturday, sat down to write the first chapter on Sunday, and the words just started flowing. 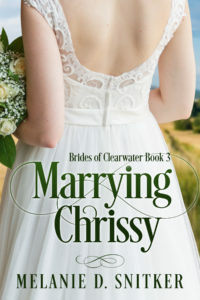 I already love how Marrying Chrissy is coming together, and I’m thrilled with the cover! I hope everyone will enjoy Chrissy and Wyatt’s story. Marrying Mandy – Mandy Hudson swore she’d never marry. Abandoned by her parents and raised by her grandparents, she has a hard time trusting that real love will last. When her grandmother dies, Mandy’s shocked to discover a stipulation in the will. Considering marriage to her best friend may be the only way to keep her family’s beloved bed-and-breakfast. Marrying Raven – Raven Weber hates football. As if her fiancé breaking off their engagement to follow his NFL dream wasn’t bad enough, her football-obsessed family only made things worse. Twelve years later, she pours everything into her job as a physical therapist assistant. Helping others never prepared Raven for the day her ex would hobble back into her life. How can she remain professional when spending time with him only reminds her of what they’ve lost? On another note, we’ve added a new member to our family. Meet Reeces, our guinea pig. I’ve always had a soft spot in my heart for guinea pigs, and had them as pets growing up. But it’s been about twenty years since the last time I had a one. We’ve only had him for a few days, but our kids are already completely taken with his cute little face. I have to say, so am I. 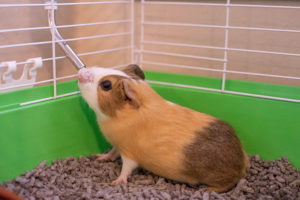 Do you keep small animals for pets? Contest – I’d love to give away a $5.00 Amazon gift certificate to one random person. To enter, comment below and tell me about your small pet. If you’ve never had a small animal as a pet, why is that? I’ll leave the contest open through Monday, and a winner will be contacted by e-mail. We always seemed to be “borrowing” the classroom pets. Maybe no one else wanted a turn. That’s a great way to see what kinds of little pets you like or not. We have Queensland Stick Insects- not at all a traditional pet!! We also have 2 Bearded Dragons in the school Biology lab that we help look after- my boys love feeding them and trying to get them to race across the class desks! I feel like it would be unfair to have a pet that needs lots of attention, as we are not home enough during the day. The stick insects sound like so much fun! They are a lot of fun – I had one large stick insect as a pet at one point in my teens. It was so ugly, I named it Bugly for Bug Ugly LOL But it was neat! Does a beta fish count? Lol his name is Fred! Love your post, need to check out Raven’s story, I am a huge football fan!! Of course Fred counts. How fun – Beta’s are beautiful. I hope you enjoy Raven! Hi Melanie! Eye catching cover. Over the years we have had several small animals as pets. As a child I had a parakeet. My father liked them. Then in the 1970s as newly weds, somebody gave us a canary winged bee bee parrot named Laura. She was a hoot. Laura loved to sit on our shoulders and eat the morning news. She also scared my visiting German grandmother (Oma) to death when our bright green parrot took a bath in her water dish and turned gray. Oma found the bird fascinating. We also had a hermit crab named Hermie, who was an escape artist. While on vacation, he escaped his cage. My father was upset. For almost a week we hunted through the house. One day Hermie emerged from my son’s closet. After dousing him with water and giving food, he was fine. Pets are entertaining and educational, especially for children. Have a great day. Happy Writing! Hi Sabrina! Goldfish defnitely count. Too bad he didn’t make it. Oh, how fun to have a kitten from birth. Kittens are so sweet! Hi Melanie–first off, your “Marrying” books have great premises–what fun–and also, fantastic covers! 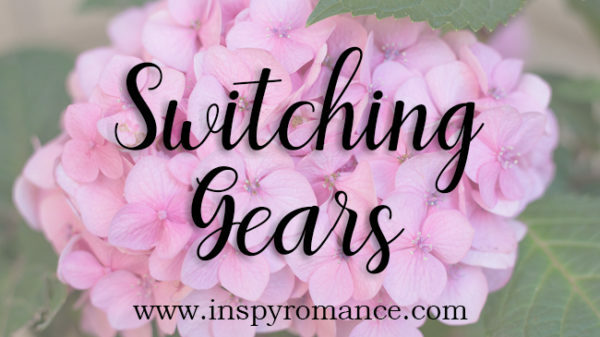 I think your decision to switch gears will turn out well. And second, I was a “bird person” for a long time when I moved around too much to have bigger pets. My favorites were my cockatiels. They are really smart and get attached to their people. Thank you so much! I’ve heard cockatiels make great pets and are super smart! They live quite a while, too, don’t they? I live in a no pets allowed apartment. I’m sure it was hard to use the mice for a science project. Interesting, though, and it sounds like you and your partner did great. When our children were living with us and younger we had a period of time where we had pet mice. Now I know EVERYONE will say…EEEWWWW. But really they are no different than your guinea pigs, just a little smaller. Our first one was called Digby and she was spotted white and black. So cute. We then had many others, but Digby was our family favorite. We actually started the small pets stage when one of my daughters was in Kindergarten. The teacher had a pet hamster in the classroom and we got to care for it during a summer break and we were hooked. You know, I’m not a fan of mice, even though I’ve had hamsters and gerbils as pets in the past. But my cousin has had mice and rats as pets and says they are some of the smartest little guys! Love all the covers, and the blurb’s on the first two sound like they are good books. We currently have an Oscar (cichlid) fish. We can’t have furbabies in our rental. Thank you, Andrea! Oh, cichlids are so much fun. I’ve heard they have a lot of personality. Lol about Trouble and your chickens. How fun! Sounds like the chickens are super tame. How many do you have? Thank you! We’re throughly enjoying him already! I don’t have a small, medium, or large size pet due to allergies/asthma. If it crawls, flies, swims, has 4 legs, and goes woof, meow, neigh, chirp, chirp, or doesn’t say a thing, I’m allergic to it. I’m sure that’s difficult to be so allergic to animals like that, Janet. As I’m sure it’s hard to avoid them in general! I am excited about your books! At this time, we do not have a pet; our border collie was killed by a truck 2 months ago…we miss him sooo much! I hate when a book doesn’t flow. I’m glad you’re flowing now. My son and husband went to the pet store to get a guinea pig once. They came home with a rabbit instead. They are banned from the pet store. When I was young my brother and I had gerbils. However between the gerbils multiplying like crazy and then bringing a dog into our family we only had them for a couple of years. Marrying Mandy was a fun read, but I haven’t started Marrying Raven yet. We don’t have any now, but we used to have 2 hermit crabs. Our younger daughter has 3 now. Thanks, Becky! I hope you’ll enjoying Marrying Raven. Hermit crabs would be fun! We’ve had three hermit crabs, a millipede, and two African dwarf frogs. None of them are with us now. My children forget to take care of their pets and I don’t seem to be doing a good job either….so no pets for us for now. Beautiful cover! No small pets now,but had a canary,gerbils,and guinea pigs growing up. When my kids were growing up, we started with one guinea pig, a sister to the one the preschool got as a pet. We would then watch the sister over summer breaks, put her in with ours. A few years later, at the highest point, we had TEN guinea pigs, which included 2 litters of babies. I think gp’s are a great pet for a younger child. Big enough to hold easily (as opposed to hamsters etc. ), but without the big kicking hind legs like rabbits (we have had both hamsters and rabbits back in the day!!). My kids did several science fair projects with the guinea pigs. My husband built a 4 ft x 4 ft maze out of plywood, and we taught the first gp to run the maze. Did classic extinction experiment–run the maze daily for a few weeks, leave off for a week, run again, see how the time changed. Then, one year when we had a lot of gp’s, we did the maze and compared the age of the gps to how quickly they learned the maze. As expected, younger learned quicker than older!! Did you know that guinea pigs are pregnant for 60 days, same as a cat or dog, and the babies are born with teeth, with all their fur, and able to run around the cage? Cute from the get-go! Now with just the two of us, we have dogs and cats.